If you have a narrow staircase you may be concerned that a lift might not be available for such narrow stairs, but rest assured in 99% of cases we can effectively overcome such issues without resorting to serious structural works. Stair lifts are relatively uncomplicated to install and will not necessarily affect the furnishings of your home either. When you live with a loved one at home who is incapacitated and finds moving around very difficult, then stairlifts come highly recommended for providing an appropriate solution. Elderly people tend to suffer numerous debilitating conditions like arthritis and other bone and muscle conditions which can greatly affect mobility. These also include other issues like cardiovascular or orthopedic complaints, which can highly affect the mobility of a recuperating patient. 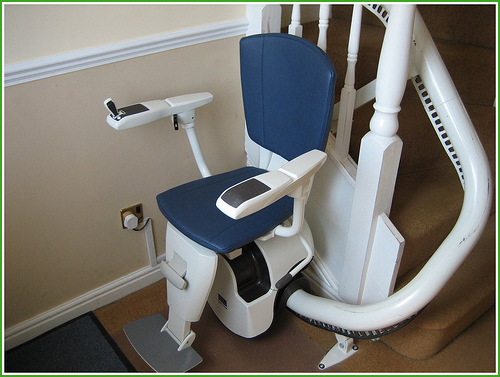 When you have a family member who has one or more of these conditions, instead of moving house to cater for their needs, you can enhance your home with a stairlift instead and if you were worried that stairlift won’t fit either because of the staircase dimensions or the height or weigtht of the user then contact us and we will see what is possible. When you have narrow staircases in your home but are in need of a stair lift, you don’t have to worry as there are a number of stairlifts which are intentionally designed to fit narrow staircases. Commonly, the narrowest staircases are also built with a curved structure which can make the installation of a lift very challenging. A curved staircase also poses challenges on keeping the person in the lift safe when ascending and descending on the stairs. You can rest assured that our partner manufacturers have designed their products with great consideration of this issue. Typically in areas where homes are built tall, narrow and thin or the property is old or specifically designed to maximise living space by making the stairwell narrow it is expected that the staircases will have a narrow width. Contact us for a survey of your stairs, especially if you have been told by other firms that it is impossible. For extremely narrow stairways, a standard chair lift and it’s user can hardly be accommodated so some designs are made in a way that the person sitting it will have to sit sideways. In some instances, a lift can also be on both rails so the person using it is directly lifted instead of a sideways lift. Stairlifts for narrow stairs will have to be custom made to appropriately fit the dimensions of the the stairs. Customization will definitely affect the stairlifts prices. The customized product will cost a little bit more compared to buying a standard design. It will provide greater advantage if you will try to search first for lifts with slim designs before you have one custom made for your home or you can take the measurements of the dimensions of your stairway and search for a product which will accurately fit your stair’s dimensions. As stated, purchasing a lift with standard slim design will help you save much on the cost rather than requesting for some customizations to be done. Stairlifts for narrow stairs will function effectively and ensure safety when it is fitted and installed appropriately. However, there are also stair lift rentals which will provide you with a unit only for rent. Expensive in the long run that method of getting a stairlift is not really that economical, so we advise most people to purchase one. Stairlifts come with a seat that is secured to the rails installed throughout the the sides of your stairs. At times when the device is not in use, it can be conveniently folded to facilitate the normal use of the stairs. Stairlifts for outdoor used are also available to help the elderly persons move around with ease outside your home. This device functions using electric power but there are models which can also operate on batteries. This feature provides great advantage as you not need to worry about getting stuck in the middle of the stairway when there is a sudden power interruption. Stairlifts for narrow stairs are also available in various designs and colors that will effectively blend with your interior home design. A stairlift is generally composed of a seat, an armrest and a footrest which are all foldable. Like the standard design, stairlifts for narrow stairs comes with simple operating function. Its controls can be located one of its arm rest or may come connected to a wire with a storage area on the unit. Normally, controls are also available on the upper and lower part of the rail to bring the lift in. Some models are designed to operate using remote control which adds to the operational convenience of the lift. To ensure optimum safety of the user stairlift of varying models, especially those stairlifts for narrow stairs comes with a seat belt to secure and protect the user. Users need to securely fasten the seat belt first before operating the lift. Sensors are also strategically incorporated to detect any obstruction on the lift’s path and prevent untoward accidents. There is no need to be anxious a lot when you are looking for stairlifts for narrow stairs. With relevant details on where and how to find one that will suit your home, in no time you will be able to enhance your place the way it should be to help your elderly and debilitated love ones move around more easily. Ask us anything about stairlifts. We will answer just as soon as we can. © 2019 Stairlifts For Narrow Stairs. All Rights Reserved.